A few months ago, Verizon announced its plans to buy the once-thriving Internet giant, Yahoo!, in a $4.8 billion deal. But this was well before we found out that Yahoo! fell victim to the worst data breach in history, with 500 million email addresses, passwords, birth dates, security questions, and security answers stolen. And there’s strong evidence suggesting that Yahoo! knew about it long before the Verizon deal was ever made. Since then, Verizon has gone mute on the status of the deal. Even the CEO of Verizon-owned AOL, Tim Armstrong, has been ducking questions about how the hack could affect this deal. Now, with all this uncertainty about the future of the deal, investors everywhere are asking whether or they should buy Verizon Communications, (NYSE: VZ) or sell Yahoo! Inc. (NASDAQ: YHOO). When we first heard about Verizon’s multi-billion buyout of Yahoo! Inc., it seemed like nothing but dollar signs ahead investors in either stock. But thanks to a lot of questions surrounding the largest hack in history – and when Yahoo! knew about it, this acquisition may not even happen anymore. And if it does, Verizon may not be willing to pay $4.8 billion for it anymore. First of all, it’s no surprise that Yahoo! has been losing account holders for quite some time. Over the past few years, it’s been losing ad revenue and accounts. I actually had a bit of a chuckle when I heard Yahoo! blaming the hack for “several” account closures. Now the public relations team may be using the term “several” as a means to downplay the actual number of accounts that have been closed since the news broke. But even so, they sure aren’t saying that the company will be okay. So do you look at this as an opportunity to buy VZ or sell YHOO? 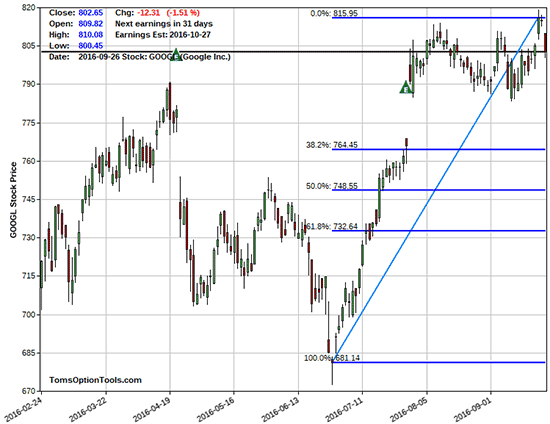 Alphabet, Inc. (NASDAQ: GOOGL) is the parent company of Google. And as one of the most popular (if not the most) email service providers, it’s could easily be considered the biggest winner in the Verizon – Yahoo! deal. Now you could buy the stock… But keep in mind that GOOGL is trading right around $777 per share right now, which could be a bit expensive. And forget about buying a substantial of stock without a huge price tag. Just 100 shares of stock would cost you $77,700. If you do want to spend that kind of money, you would have the opportunity to write covered calls. Remember, though, that you do face the risk of having your stock getting called away from you, making you susceptible to missing out on an upward price movement. And you still have to buy the stock to do this. If GOOL retraces further from $815, there is price support in the $785 price area. Beyond that, the first Fib retracement level on the chart above is the 38.2% line, which shows GOOGL at $764.45 (if it were to come down that far and act as support). I drew in for you the additional Fibonacci retracement levels to monitor above as well. Also, GOOGL’s earnings come out on October 20, so you’ll want to pay attention to the price movements after those come out. But if owning the stock outright seems too unrealistic, given the current stock price, you could also consider buying Long-term Equity AnticiPation Securities (LEAPS). LEAPs are long-term stock options with expirations as far out as two and three years. LEAPs allow you to take part in a price increase without the high costs of buying the stock outright. And since LEAPs have much longer expirations, you’ve got much more time for the trade to move in your favor. You could go out as far as January of 2018, using the at-the-money call options currently priced at $95.50. One option contract would cost about 12% (or $9,550) of what you’d pay to buy 100 shares outright. And even though a LEAP is an option, it’s as close to owning GOOGL for a long period of time without actually buying the stock. And if you’re not interested in holding LEAP options for up to three years, and you definitely don’t want to buy the stock, you can always fall back on an effective lower-risk and lower-cost strategy – the debit call spread or the put credit spread – provided you expect GOOGL to jump higher in price.